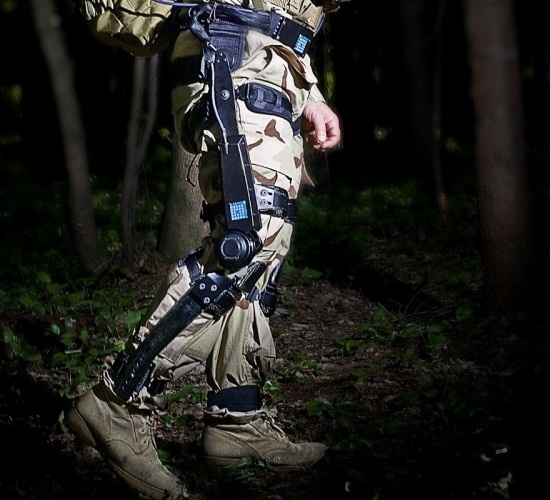 Lockheed Martin has revealed its latest exoskeleton technology, designed to help soldiers carry heavy equipment for long periods over rough terrain. The Fortis Knee Stress Release Device (K-SRD) uses sensors to detect the user’s speed, direction and angle of movement. An onboard computer then instructs electro-mechanical actuators at the knees, boosting leg capacity for tasks that involve kneeling, squatting and lifting, or climbing with a heavy load. According to Lockheed, the benefits of the exoskeleton are most noticeable going up or down stairs, or crossing undulating terrain. As well as a military version, the Maryland-headquartered defence giant has also developed models for industrial workers and first responders who have to carry out strenuous and repetitive tasks in challenging environments. Lockheed is one of several organisations around the world developing exoskeleton technology. Last week The Engineer reported on an exoskeleton that could detect loss of balance and provide support to prevent falls. The research has implications for older people, for whom falls are one of the leading causes of injury. Travellers to mars might need them after all the bone loss etc that they would suffer on the journey there. I hesitate to offer the analogy of the US ‘work-in-space’ ball-point pen (which cost $millions to develop) whilst the former USSR used pencils. Apart from serving the macho- aspects of soldiers, (who for some reason want to show their strength by carrying as much as they can…) why not a simple wheeled (or two dragged-crossed ‘sticks’ as used by the Viet Cong and indeed original ‘Indians’ in N America) system: which did excellent service as an all-terrain load transfer device. The analogy is wrong in any case as pencils can’t be used in space – graphite dust is a spark hazard. The Russians used ordinary ballpoint pens. Famous urban myth that isn’t true. The “space pen” was developed by a private company, Fisher, and used by both US and USSR space missions. You can still buy it today, it’s a rather good pen. Why bother having a human in it at all, just do it remotely with VR. Not questioning other’s knowledge…but close US colleagues (formerly of Gentex Inc, Carbondale, Pa, USA and ILC, Dover, Delaware,) who jointly and severally were involved in the fabrics for the space-suits and that for the original ‘gliding structure’ which was to bring the Apollo Capsules ‘back’ [this was so-called tri-axial material: three ‘sets’ of yarns at 60 degrees , not the usual two at 90 degrees: consequently this did not have a possible rip/tear plane weakness….) with an intimate knowledge of all the ‘stuff’ inside the capsules… were my source in the 80s for this. (Several had close links with their Soviet counterparts?) Not sure about Stuart’s reason – graphite being a spark hazard: it is, but there were plenty of other hazards -of which the earliest ‘high percentage Oxygen) atmosphere scenario ‘ -the basic cause of the fire which destroyed one of the earliest tests +sadly the three inside- was the most potent. I gather that red (probable in view of the ‘colours’ of the then USSR) crayons have no black/carbon content!